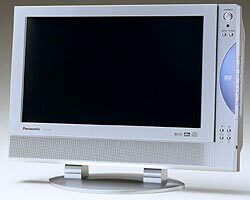 Panasonic has just announced what could be the ultimate easy-to-move HDTV "set". The TC-11LV1 combines a super-bright, 11-inch 16:9 LCD screen, a progressive scan DVD player and two speakers into a sleek, stylish package. With its small size, the TC-11LV1 can be used on a desk, breakfast table or even a vanity. No more "going to the media room" to watch DVD or HDTV broadcasts. Tilts up and down to adjust viewing angle. NTSC signals are enhanced using the built-in progressive scan converter resulting in a sharper image with no visible scan lines. To further enhance the viewing experience, Active Light Circuitry (ALC) automatically detects the brightness levels of the incoming signal and adjusts the LCD backlight accordingly. Also, the Active System Control technology works in tandem with the ALC to dynamically adjust the video signal, according to image contrast. This adds brilliance to bright scenes and greater depth to darker ones, resulting in more vivid images. Now if they could only add this same technology to digital videocams, we'd be all set. If you don't want to watch TV or play a DVD, the Panasonic TC-11LV1 also plays music CDs. Scheduled for November 2001 introduction.